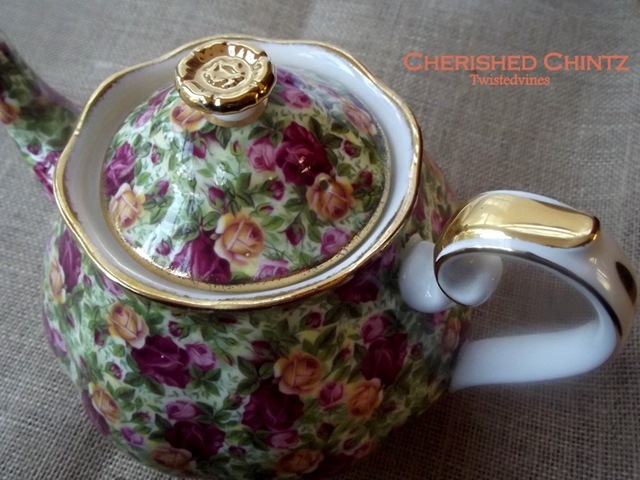 I have wanted a piece of chintz for a long time, I know many of you have such a cherished piece already in your keepsakes, a few months ago, an opportunity arose, for a little ‘indulgence’ so I bought this tiered stand and beautiful teapot. What better way to display these delicious choc chip cookies. A beautiful pink/crimson rose and apricot chintz with gold trimmings. 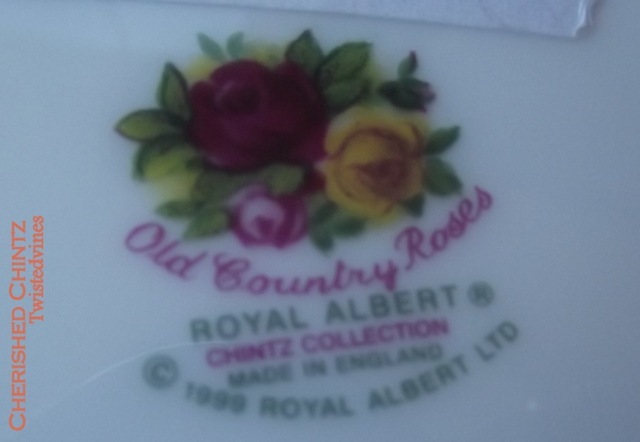 Royal Albert ‘Old Country Roses’ Chintz Collection and even better an original piece Made in England. Preheat oven to 190°C. Cream coconut oil,almond butter with an electric beater until creamy. Add the egg and beat for a further minute. Firstly combine all the ‘wet’ ingredients: honey, vanilla extract and lemon juice and palm sugar. Combine well and mix into egg mixture. Beat well. Then add the sifted ‘dry ingredients’ coconut flour and baking soda. Add the mini chocolate chips. For some added texture raisins or cranberries can also be added for extra texture. Roll a teaspoon of mixture into individual balls and place on oven proof baking paper on tray. Press lightly down with either your fingers of a fork to make round cookie shape. Bake in a moderate oven for 8 to 10 minutes until golden. The cookies will still be soft when you take them out of the oven. Let cool on tray. 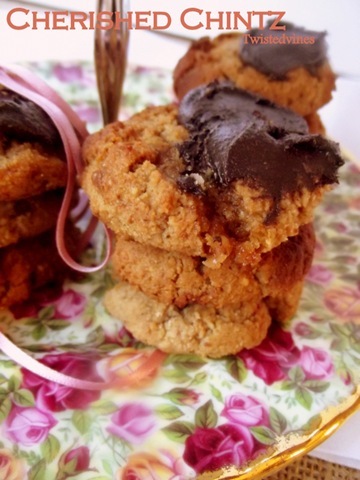 Melt the dark chocolate and coat one side of the cookie for added decoration. 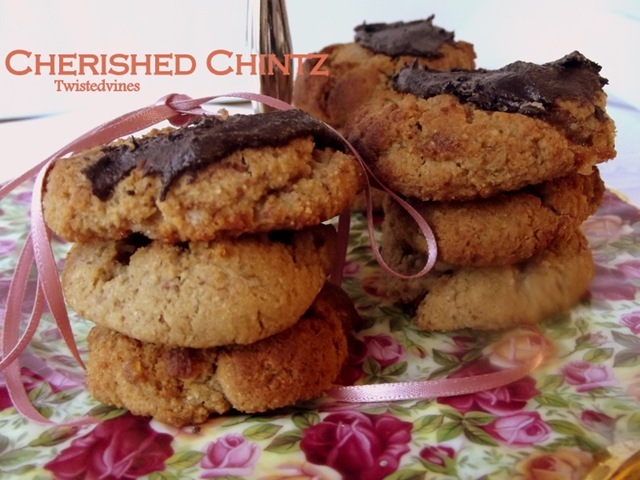 A wonderful gluten/grain free cookie recipe. You’ll love the taste of these cookies. Beautiful china! The sweets look good too! Oh my, Yvette, what a gorgeous chintz teapot and tiered stand! You did well to find them. LOVE them! Your cookies look wonderful too. Would love to join you for tea and cookies! Thank you for sharing and joining me for tea. 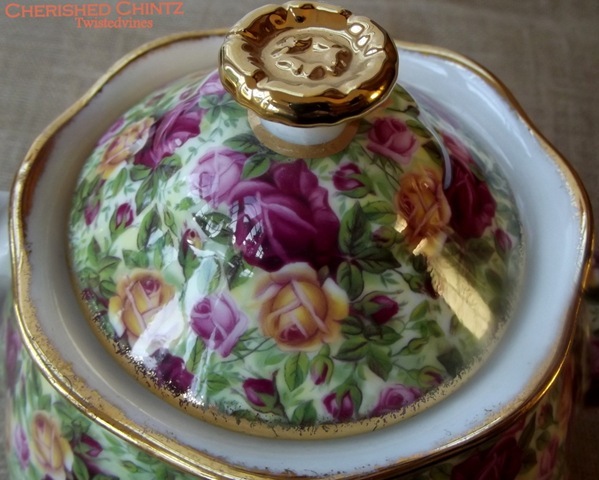 Any chintz china is beautiful, and yours is no exception.Lovely post! Your desserts look awesome. I never thought of adding melted chocolate to chocolate chip cookies (esp. dark chocolate!). That’s a great idea. 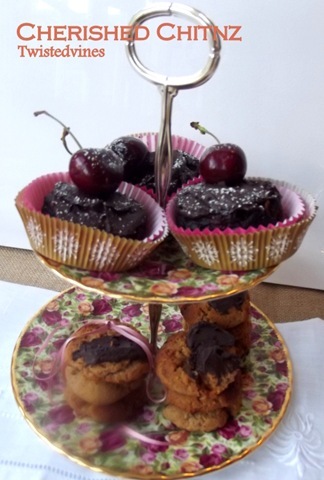 And, I still love that cherry chocolate idea. MMMMM. Oh I too have a weak spot for chintz! I only have a few pieces, but they are prized. 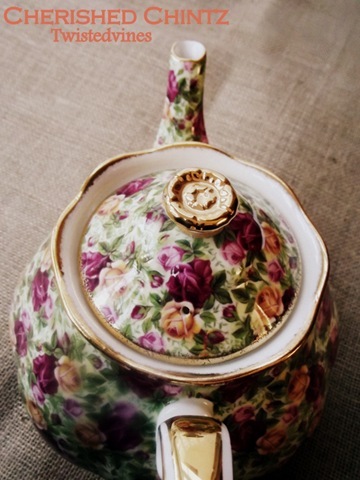 Your new tea pot is gorgeous for sure, I love that pattern and the shape. And your dessert server is beautiful as well, and decked out with those delicious looking treats! Wow! thanks for linking up to Heart & Home today. 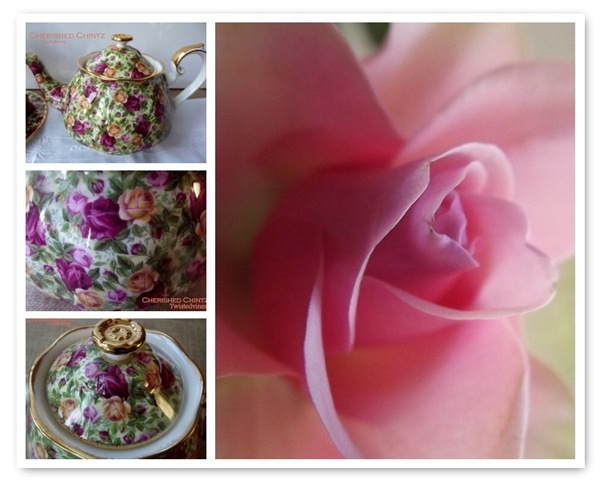 I love chintzware too and your chintz teapot and cake stand are very pretty – what a rich and stunning colour! And your gluten free biscuits look great. I like your tea pot, it’s a lovely shape and the colours are so pretty.